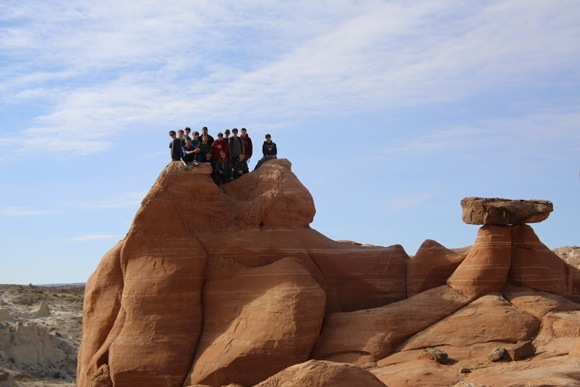 Twenty-three Hillview Middle School 7th and 8th graders toured a number of Western parks and monuments during spring break in a trip that was coordinated by James Green, Hillview’s 6th grade science teacher, who’d led similar trips when teaching at another middle school. They flew from SFO to Nevada and visited Zion National Park, Kodachrome State Park, Bryce Canyon National Park, Sunset Crater National Monument, Montezuma Castle National Monument and the Grand Canyon. They also enjoyed a trip on the Colorado River and mountain biking through the red rocks of Sedona. Mr. Green developed the trip to extend learning outside of the classroom and plans to offer the trip every other year to Hillview students. “It is a joy to see the students experience these incredible places by actually hiking or biking them,” he said.